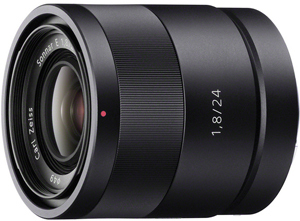 The Sony 24mm f/1.8 E Mount Carl Zeiss Sonnar Lens is designed for crop sensor E mount cameras, such as the a6000. It is also compatible with the a7 series of Sony cameras but only when shooting in crop sensor mode. This prime lens includes a fast f/1.8 aperture for optimal use in low light and sports a Direct Manual Focus feature that allows you to fine-tune your focus manually even after AF has locked onto your subject. The AF operates with a linear motor and a stepping motor that is quiet enough for video shooting. This lens is wide enough for group portraits and scenery without producing edge distortion. It is well suited for events. • This lens is compatible with Sony E mount cameras in crop sensor only. The focal length equivalent for 35mm format is 36mm.